"Kashmir’s treasure lies in its enchanting Mughal gardens, lush landscapes, Himalayan range and the irresistible allure of Dal Lake and houseboats". Kashmir has always remain a favorite retreat of emperors, kings and even the english during British Raj. 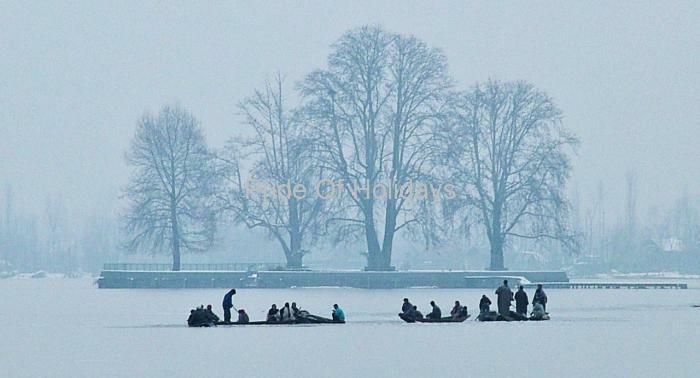 Its salubrious weather throughout the year, Kashmir holiday tour is one of the most rewarding and fulfilling experience. It is also one of the most popular romantic gateways in India and attracts couples and honeymooners alike. Discover the jewel of Kashmir when you embark with us on this Kashmir Holiday Tour of 7 Nights 8 days at Pride of Holidays and take away experience of a lifetime. After breakfast in the morning, we will begin our country side day trip towards Gulmarg. Enjoy the Gondola (Cable car) ride which is highest in Asia. It has 2 phases.The first stage transfers from the Gulmarg resort at 2,600 m (8,530 ft) to Kongdoori Station in the bowl-shaped Kongdori valley. The second stage of the ropeway, which has 36 cabins and 18 towers, takes skiers to a height of 3,747 m (12,293 ft) on Kongdoori Mountain, a shoulder of nearby Afarwat Peak (4,200 m(13,780 ft)). In Dinner and Overnight in hotel. After Early Breakfast, you can take a walk or hire ponies (Direct Payment) and visit the Famous Golf Course , St Marry Church and Rani Temple. Enjoy the Gondola (Cable car) ride which is highest in Asia. It has 2 phases.The first stage transfers from the Gulmarg resort at 2,600 m (8,530 ft) to Kongdoori Station in the bowl-shaped Kongdori valley. The second stage of the ropeway, Overnight at Hotel. Check out, Drive towards Srinagar (Three and a half hour). After check in and refresh, go for Local Sightseeing of famous Mughal Gardens With terraced lawns, cascading fountains, paint-box-bright flowerbeds with the panorama of the Dal in front of them - the three Mughal Gardens of Chesmashahi, Nishat and Shalimar are the Mughal Emperors' concept of paradise and are today very popular places for picnics and excursions . In the Afternoon visit Jamia Masjid, Hazratbal Shrine and Shankaracharya Temple. Overnight at Hotel. After Breakfast ,drive towards Sonamarg 4 hrs at an altitude of 3,000 meters above sea level, 87 km north-east of Srinagar. Sonamarg which means 'meadow of gold is a beautiful spot full of snow clad mountains, fast and flowing water and vast meadows. You can also treck or hire ponies (Direct Payment) and visit Thajiwas Glacier which remains snow clad throughout the year. Return back to Srinagar and Overnight Stay at Hotel.